Thank you for your interest in Detroit Mercy Dental Center on behalf of the University of Detroit Mercy School of Dentistry. We provide patient-centered care and comprehensive dental services in a state-of-the-art facility. Most patients are part of the student clinical program where student doctors provide treatment under the supervision of licensed faculty dentists. Student dentists provide top-quality services, but please note we are located within an educational setting and appointments may take longer than a visit to a private dental office. Because of this, services are provided at a reduced rate making costs more affordable for the patient. We are excited to announce that this week we have begun construction on a new and enhanced reception area for our patients! Over the next several months, this project will relocate the current patient entrance, which will be a few steps east. Please see the attached map for reference. We anticipate construction to be completed by October 2019. We ask you to please pardon our dust and for your safety, avoid all caution tape and construction areas. "Excellent care for all my dental needs, and a genuine concern for a higher quality of health. 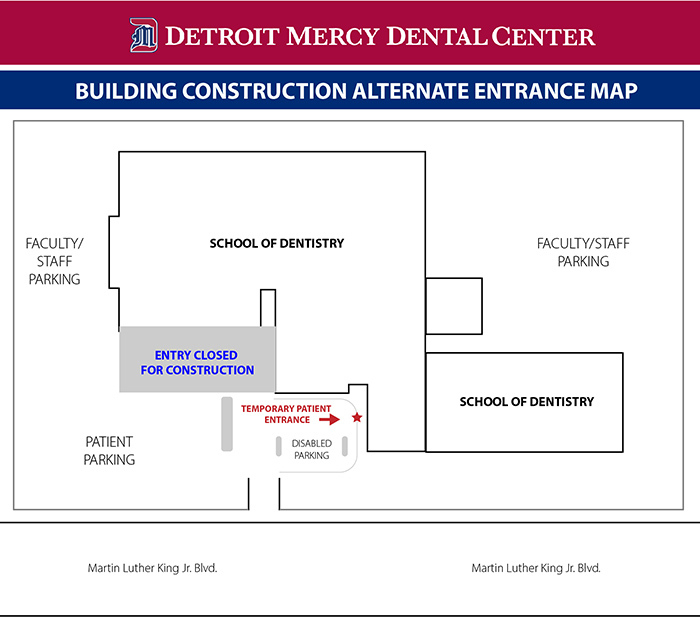 I have recommended Detroit Mercy Dental Center to others." "My student dentists have been kind and knowledgeable. I like the amount of time that is put into my appointments." "I enjoy the fact that my treatment is being used to educate others. My appointments are very informative, I actually learn a lot myself listening and asking questions." Student doctors provide treatment under the supervision of licensed faculty dentists. We offer a variety of specialty services and happily accept referrals from outside dentists. Our faculty provide care in a private practice-like environment. Were you referred for specialty treatment? Become a patient at our Faculty Practice.